It's hard to believe that today marks the one year anniversary of my Vox. How quickly the time passes! I'm so glad to have started this blog last year: I've learned to appreciate food in so many ways – whether it was in making it, eating it, photographing it, writing about it, or the constant pursuit of new things to make. And along the way I've met so many of you wonderful Voxers whose ideas and skills inspire me and encourage me to maintain this food blog. It has honestly become one of my most beloved hobbies. For this coming year, one of the things I would like to improve on is my photography. I think the first step will be to improve my camera… after all, it is a point and shoot from 2003! (I use a Nikon Coolpix 3200… really one of those ancient puppies that is very reliable but limited in its abilities). Of course, I am still a student, and will be for many years yet if you tack on medical school, so I don't have the money to buy a nice DSLR camera. My boyfriend knows how much I love food photography, and generously offered to buy me a newer point and shoot for my birthday next month – a Canon A720, which is very well rated and what many consider to be the perfect compromise between a point & shoot and an SLR. I'm so excited! Of course, I am still very limited in my resources for photography. I have no access to daylight in my apartment (just one window in the bedroom that gets indirect light), and I enjoy baking at night anyway. I also have no mini tripod (plus shaky hands), no natural looking lighting (only the harsh fluorescent overhead lighting of my dorm kitchen), and no nice bowls or plates. These are all things that I can do very little about, but that have not stopped me from doing what I love. I hope to improve these conditions with time, so bear with me :) Here's to another year of baking, cooking, and eating! Now then, you didn't think I'd forget to bake something to celebrate my Vox's birthday did you? Of course not… except I looked in the kitchen and realized that I have no eggs and less than 1 stick of butter. Well I figured I could find some sort of vegetarian or vegan recipe that is free of eggs, and I did find many of those at eggless.com (of course, haha). A recipe for cream cheese butter cookies caught my eye, and I noticed that it was basically a thumbprint cookie recipe. That sounded cute and refreshing to me, and a nice way to use some of the jam I had lying around, since I don't eat bread much. The recipe was super simple, which originally made me a bit suspicious, but the end product eased all my worries. Even though these cookies are eggless, they taste fantastic… with a light buttery scent and a slight sweetness that pairs great with the jam filling in a small bite-sized cookie that looks pretty. Love it! 2. Cream together butter and sugar. Stir in cream cheese until well-mixed. Add vanilla. 3. Gradually sift in flour and stir until blended. Chill briefly (30 min) if desired, to make dough easier to work with. 4. Roll dough into small balls about 3/4" in diameter, and place on an ungreased, foil-lined baking sheet. Using your thumb, push down to make an indentation on each ball. Fill with about 1 tsp of jam each. 5. Bake cookies for 15-20 minutes, until they just begin to brown. Remove and cool on a wire rack. 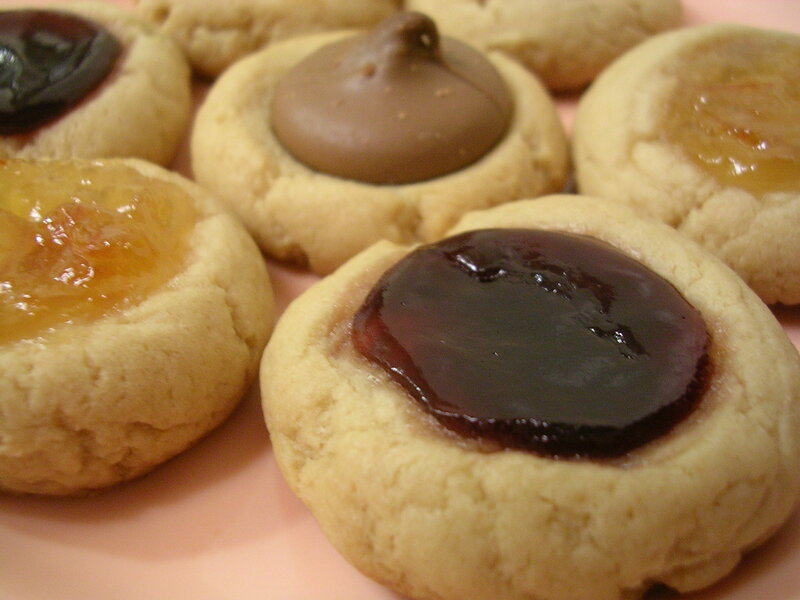 For my cookies, I experimented with several fillings – orange marmalade, raspberry spread, milk chocolate kisses, and creamy peanut butter (at the request of my boyfriend). I personally thought the raspberry filled cookies tasted the best, followed by the orange marmalade ones, then the chocolate ones. The jam cookies were in general better than the others, because the tartness offsets the sweetness of the cookie to make for a bite that is well-balanced in flavor. 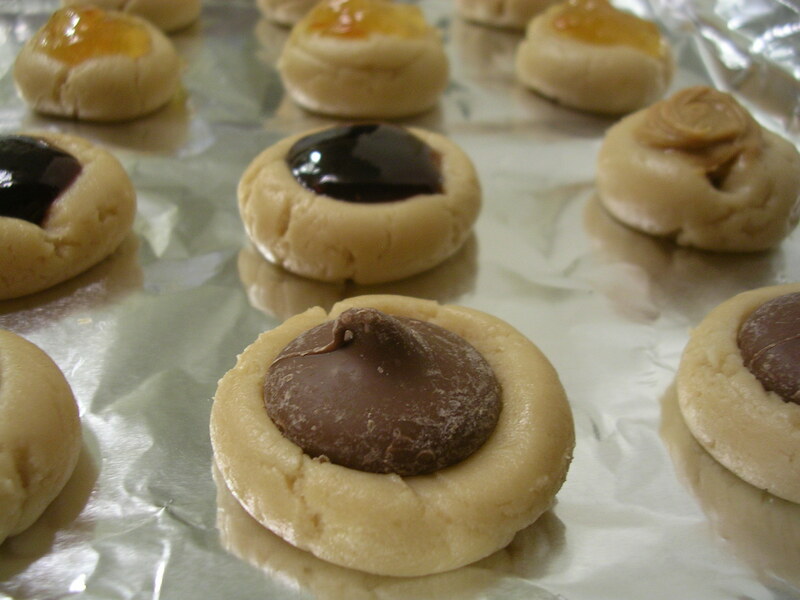 The chocolate kiss cookies were decadent, but were a bit sweet, though probably perfect for kids. Finally, the peanut butter ones were lacking a little something, I think it would have been better if I had added some sugar to the peanut butter itself, as it has a native saltiness to it that was odd with the cookie. This entry was posted on Sunday, March 9th, 2008 at 5:41 am	and posted in baking, desserts, fruit and nuts, recipes, Uncategorized. You can follow any responses to this entry through the RSS 2.0 feed. Happy 1 year at Vox! How fast does time fly?